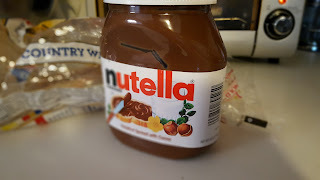 "%$^*ing Nutella", I mutter under my breath at 6:30am every morning. Declan has to have Nutella on toast, well not just on toast, on anything one can possibly put into the toaster oven: country white bread, English muffins, rolls, biscuits, even everything bagels. It all begins with the morning "helplessness". "Mama, can you split this, slice this, get this, for me???" Declan is about to turn eleven years old. I was making my own lunch to bring to school, cooking my own grilled cheese sandwiches and burning batches of cookies in the oven when I was younger than he is now. I guess I created this baby monster by not wanting him in my kitchen except when invited by me. The main reason is that he is a slob. Not in the usual kid messy kind of way. It's more like he is Pigpen and the Tasmanian Devil wrapped in one; the mess is so dirty and EVERYWHERE. I find evidence of his Nutella on toast all over the house, long after he has boarded the school bus. Dark brown, pasty chocolate and hazelnut spread on cabinets, drawer pulls and blankets. I even once noticed a long, dark, trail made by small fingers at just the right height on the pristine white bathroom wall while I was using the toilet one morning. You can imagine that my blood pressure spiked before I realized that it wasn't actually a poop hand print. It would make my life far easier if I stopped supplying the Nutella. 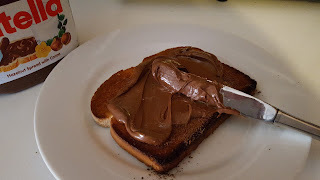 However, the chocolate, hazelnut spread makes up approximately 95% of my son's diet. It would not do to have a malnutrition-ed child in the house. By the way, this Nutella addiction is all my fault for introducing that drug in the first place. Once I've sliced, fork split or found the desired bread vehicle for his breakfast, I leave Declan to toast, watch over and retrieve his breakfast. He then slathers the Nutella on top. I cannot bear to watch this process. It's slow and drama filled. Declan, like myself, is not a morning person. He is barely functioning at that time of day on top of being horribly messy. As he manages to get Nutella all over the blades and handles of at least 3 table knives, the smearing takes approximately, 10 minutes with much of the gooey, now heated chocolate spread landing along the edges of the plate, not on the bread and all over his hands soon to touch everything in sight. Then he takes his sloppy Nutella covered hands, plate and toast over near my couch to watch t.v. and prolong this daily agony we call, "breakfast". He is only allowed to sit on the floor-and yet, somehow I find on many mornings, after he has left for school, a shmear of Nutella on a light blue throw pillow, the buttons on the t.v. remote clogged with chocolaty goodness. I never know where I might see evidence of the offending meal as I get ready for my own day, once that kid has left the house. I curse as I scrub the caked, muddy evidence of my child from every nook and cranny. I shudder to know that I will find more evidence of this morning's meal throughout the day. 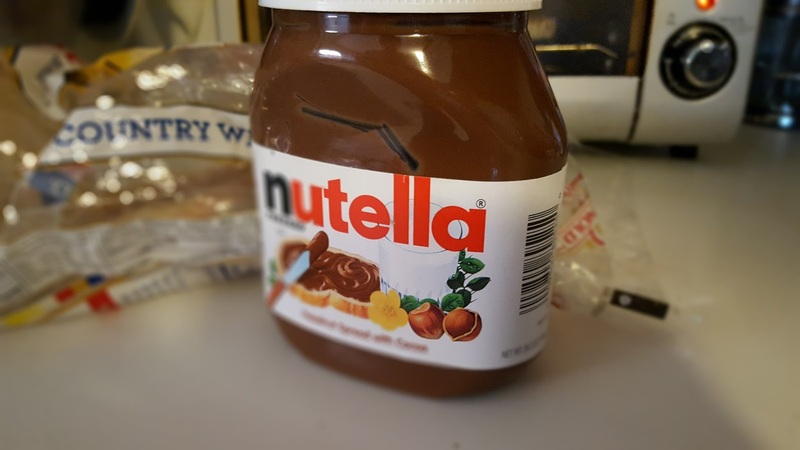 I wipe down the Nutella jar and go to put it away until tomorrow. But then I stop and pull a large soup spoon out the drawer, unscrew the cap and dig out a glob. While that slobby kid is at school, I secretly savor the Nutella chocolatey goodness as I lick it off the spoon.